Happy Friday everyone! Before we head off to our weekend festivities, I just want to share with you the results of the recent survey done by The Knot and WeddingChannel! About 20,000 couples in the US who were married in 2011 were surveyed to reveal the latest wedding budget and trend insights in the $74 billion wedding industry. Here are the key findings from the survey. 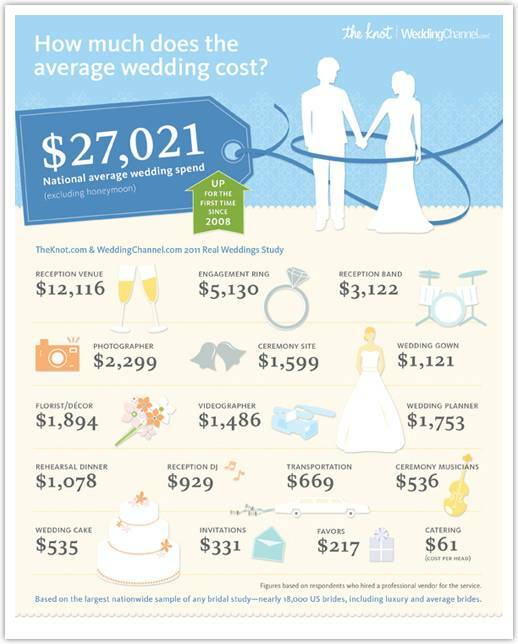 Since 2008, the average wedding budget has grown year over year, to $27,021. More couples are leaning towards a more casual wedding. While the “semi-formal” style category still reigns, fewer brides are opting for a “black tie” event. Seeing this result, are you surprised or do you agree? Below is an infographic of the results. Very cool, but they forgot wedding bands, which is what I wanted to know lol. I am astonished at the average reception venue site!